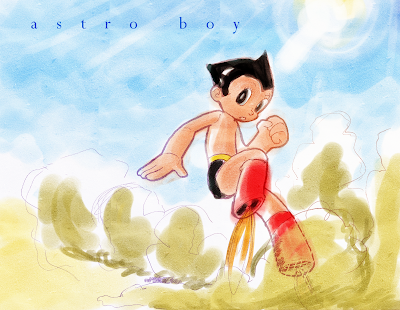 What can I do to be like you and become a real Astro Boy? Very cool. I really like the composition of this picture, and I think this watercolor thing is working for you. I wonder what would've happened if you hadn't put space between the two parts of his name? We would've been tricked into reading it as ASTROBOY at first, but it might look prettier and/or more design-y. Remind me to tell you about Amy Stery some time. His feet still creep me out, but that's not your fault. Hahaha! His feet, really? They're like my favorite part! Even more than the ridiculous pointy hair, which is saying something. The way the feet go away and make little rocket boosters? I've always thought that that was totally sick. Sorry, but I can't think of a more accurate word. I felt this way even when I was like-twelve. Guess I'm weird. but we already knew that. And, pray, do tell! Who the heck is Amy Stery? I could just treat it like my Google of the Day, but I'd rather hear it from you. I also think the feeti-into-rocket-boosters thing is totally sick, but we may be working with different definitions here. Ha. I doubt you'd be able to find Amy Stery on Google...(trying it out)... Well, I guess you can, but it's not the same one. Anyway. When I was twelve or thirteen I was given this book called _Cankered Roots_, an LDS genealogy mystery. One day, my mom was telling her sister about it over the phone and asked me who the author was. Looking at the cover, I told her that it was by Amy Stery. She relayed this information to Aunt Annette and life continued on for five minutes until I suddenly cried out, "No, wait! It's by G.G. Vandagriff! The subtitle is 'a mystery.'" The subtitle had been spelled out at the bottom of the cover in widely-spaced letters, so it looked like a m y s t e r y. Yeah. Mom never let me live that down. My mom sitting next to me was freaked out and told me to stop it.